I was in Zell am See and stuck – it was a great place to be stuck – with alpine lake and mountain views, but I was being seduced by the town and struggled to discover the rest of the area although I’d heard there were many great things to do in Salzburg. Seeking a day out from my resort Hotel Neue Post, I headed to one of Austria’s most famous cities. Salzburg has it all, I was told. Rich culture, fascinating history, delicious Sacher torte chocolate cake – not to mention settings any Sound of Music fan would recognise. And after just an hour and half’s train ride, I found myself strolling through its broad boulevards, understanding why UNESCO declared Salzburg a World Heritage Site in 1997. The old town has been wonderfully preserved with baroque architecture guiding my path through its history. Each narrow street and passageway offers a glimpse into an age long since past with ornate iron signs hanging above quaint little shops. While its spacious squares and courtyards have statues and fountains recording the city’s long history. 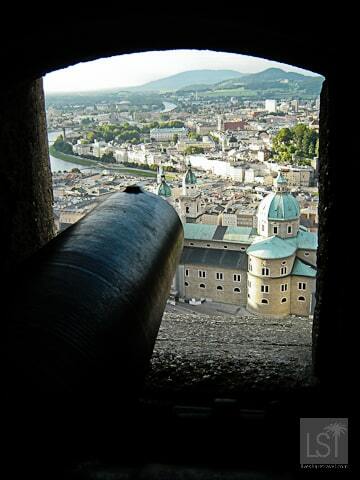 Dominating this mountainside city is Festund Hohensalzburg castle. Built in 1077, this medieval marvel transports you back in time behind fortified walls guarded by cannon sentries. And also provides glorious views of the city on one side and the Alps, racing to the heavens on the other. The view, and perhaps, the purity of the alpine air, held me in the moment as I paused to breathe it in. The mix of bright sunlight danced with puffs of cloud over a patchwork of green fields, yellow wild flowers and the white of ice-capped mountains. It’s only fair here to at least mention the Sound of Music. As it was within these spellbinding peaks and valleys that it was filmed and Julie Andrews sang about the hills being alive. I was surprised to discover that Austrians don’t know the film well, if at all, or understand why it is so highly regarded around the world. However, there’s a plethora of coach tours from the city to visit locations from the film for those keen. 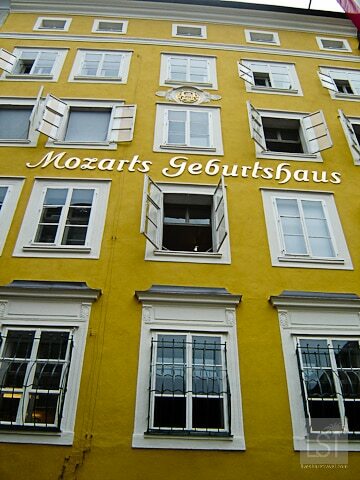 I preferred to find out more about Salzburg’s other musical contribution to the world. 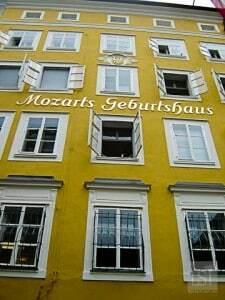 For the city is the birthplace of prodigious composer Mozart. And at Hagenauer Haus, his former home which is now a museum, I discovered more about him. There I marvelled at how while still only a child he produced beautiful music on the tiny instruments – a violin, clavichord and fortepiano – which all stood before me. My hunger for history satiated, but with my tummy rumbling, I set off to discover the most traditional of Salzburg’s delights. Forget schnitzel or bratwurst, at the grand 19th century Sacher Hotel, set on the banks of the River Salzach there was only one thing on the menu I wanted. 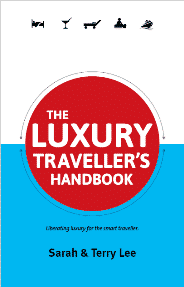 In plush surroundings suggesting old-world affluence, traditionally dressed waiters served their renowned cake – the world-famous Sacher torte – with steaming cups of coffee. This delectable chocolate cake is moist beyond belief – a delight with every mouthful. It was easy to see why its recipe is a much-guarded secret. You can have chocolate cake anywhere, but you can only really have authentic Sacher torte at the Sacher Hotel. Refreshed and with my day drawing to a close I headed down the road to the magnificent Mirabell Gardens. On this early September day the colourful flowers were in full bloom and its gardens were an oasis of peace and quiet. I only had a day to take in a few of the things to do in Salzburg but it was enough to make me want to return and taste a little more of what this delightful city has to offer. 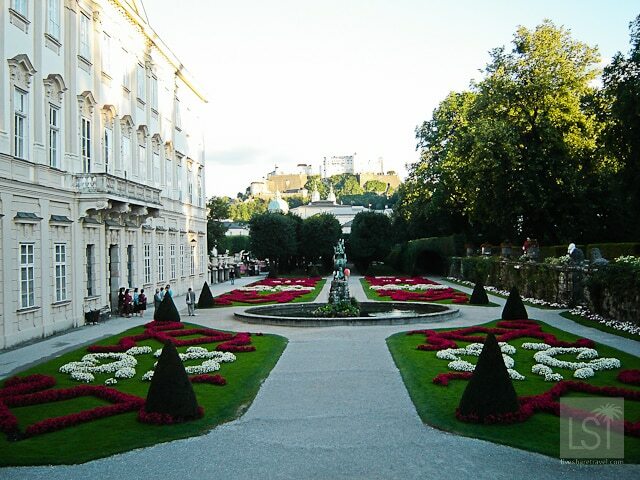 I visited Salzburg while staying at the Hotel Neue Post a timeshare resort in Zell Am See. I’ve been to Austria twice now in the space of one year and still not made it to Salzburg…Third time lucky?! When you get there you will not be disappointed. You’re in for a real treat. Now this is interesting as I have been to Zell am See skiing and we flew into Salzburg, so I have only seen the city from the sky and not on foot. But I must say as we drove to the airport it did look like a beautiful place. 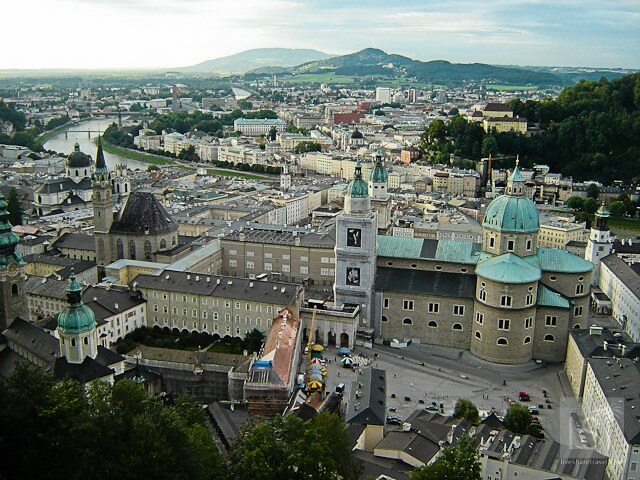 I will get back there and maybe combine a few days in Salzburg with a skiing trip. 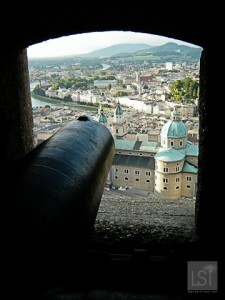 Hi Chris, When you go back be sure to visit Salzburg, you won’t be disappointed. I recommend seeing the Festund Hohensalzburg castle which will give you beautiful views over the city and surrounding countryside. @Terry, thanks for the heads up I will be sure to take a look at the castle sounds perfect. I am considering booking to go away with my wife near to Christmas later in the year, I think it would be a lovely place to spend some time at that time of the year.